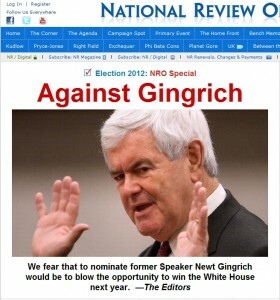 There should be no second guessing that National Review is against Newt Gingrich being nominated! We fear that to nominate former Speaker Newt Gingrich, the frontrunner in the polls, would be to blow this opportunity. We say that mindful of his opponents’ imperfections — and of his own virtues, which have been on display during his amazing comeback. Very few people with a personal history like his — two divorces, two marriages to former mistresses — have ever tried running for president. Gingrich himself has never run for a statewide office, let alone a national one, and has not run for anything since 1998. That year he was kicked out by his colleagues, the most conservative ones especially, who had lost confidence in him. During his time as Speaker, he was one of the most unpopular figures in public life. Just a few months ago his campaign seemed dead after a series of gaffes and resignations. That Gingrich now tops the polls is a tribute to his perseverance, and to Republicans’ admiration for his intellectual fecundity. This is just a small sample as to what they have to say. Read the entire article the editors put together for more.